Glory Benchmark Series 7 Cash Dispenser - Technology Unlimited, Inc.Technology Unlimited, Inc. 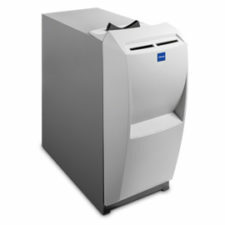 The TCD Benchmark Series® Teller Cash Dispensers provide fast and accurate banknote dispensing. System control of withdrawals makes the transaction automatic and secure. With the addition of a convenient manual drop deposit facility, the cash dispenser delivers faster customer service and greater teller productivity. + The TCD dispenses up to 15 banknotes per second and can be shared by two or more tellers for maximum operational flexibility. It can also supply real-time balances by denomination, customer or teller, to facilitate the optimisation of cash handling and processing. + The TCD provides secure cash handling in open plan environments as the banknotes are stored within a steel cabinet. + The TCD will suit most branch sizes and environments as it is available in both seated and standing versions and with 4, 5 or 6 banknote cassettes. + Reduced transaction times mean that the teller can focus on customer service and cross-selling high margin products instead of processing transactions manually.